Chatham House Rules – no external reporting without the permission of the speaker. In June 2016 Northern Ireland participated in the final UEFA Euro 2016 tournament in France. Prior to this the Northern Ireland team had not qualified for a major football tournament since the Mexico World Cup of 1986. 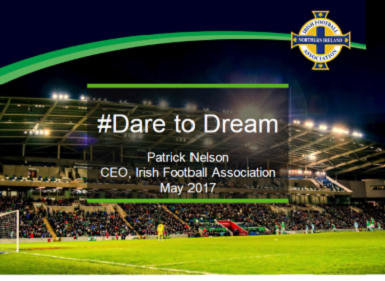 In this presentation, Patrick Nelson, CEO of the Irish Football Association (IFA) discusses how the organisation developed its governance, strategy and organisation to target qualification for UEFA Euro 2016 whilst rebuilding their National Football Stadium at the same time. ‘#DaretoDream’ was the social media hashtag the Association created to make the journey real for their players, staff and fans and quickly became ubiquitous throughout Northern Ireland as the symbol of this journey which eventually ended in Paris in the Round of 16 of the tournament on 21 June 2016. The Irish Football Association is the fourth oldest national governing body in world football, having been set up in 1880. It promotes, fosters and delivers football for all in Northern Ireland, a country with a population of 1.8 million. The men’s national team have reached the finals of the FIFA World Cup three times, in 1958, 1982 and 1986, and in France in 2016 made their first appearance at a UEFA Euro finals. Patrick Nelson has been CEO of the Irish Football Association since August 2009. In that time the Association has developed well on a number of fronts, particularly improving in the areas of governance, strategy and structure, and of course qualifying for UEFA Euro 2016 after a gap of 30 years. In this role, Patrick was also responsible for the £38 million rebuild of the National Football Stadium at Windsor Park, which opened in October 2016. Patrick is also a director of the Association’s subsidiary stadium management company and a trustee of its charitable arm, the IFA Foundation. Prior to joining the Association, Patrick was CEO at both Macclesfield Town and Notts County Football Clubs. Before moving into the football industry, Patrick worked in the global payment cards industry for many years, with roles at Capital One, MasterCard and American Express. He holds an honours degree in Business Studies from Nottingham Trent University and a master’s degree in European Sports Governance from the Institute of Political Studies (SciencesPo) in Paris. Nelson, P. (January 2017). What is the role of an independent non-executive director on the board of a National Governing Body of Sport?. Birkbeck Sport Business Centre Research Paper, Volume 10, Number 1.